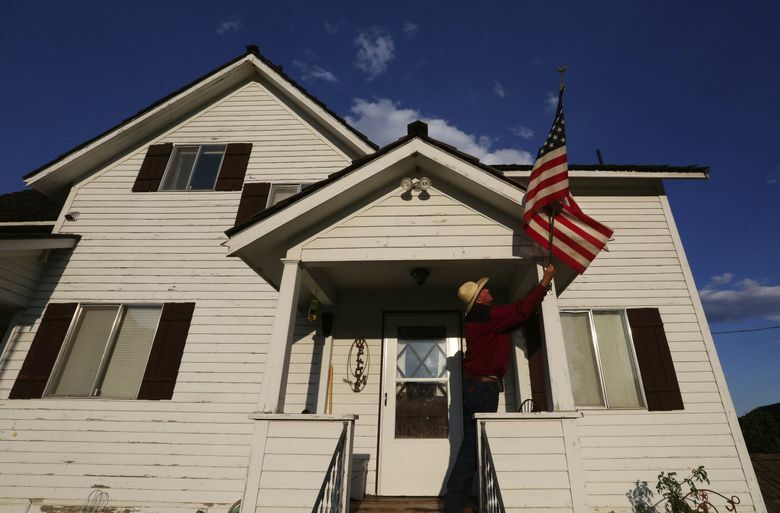 Washington wildfires take a terrible toll on ranchers who lost hay, pasture, fences and cattle to historic wildfires. 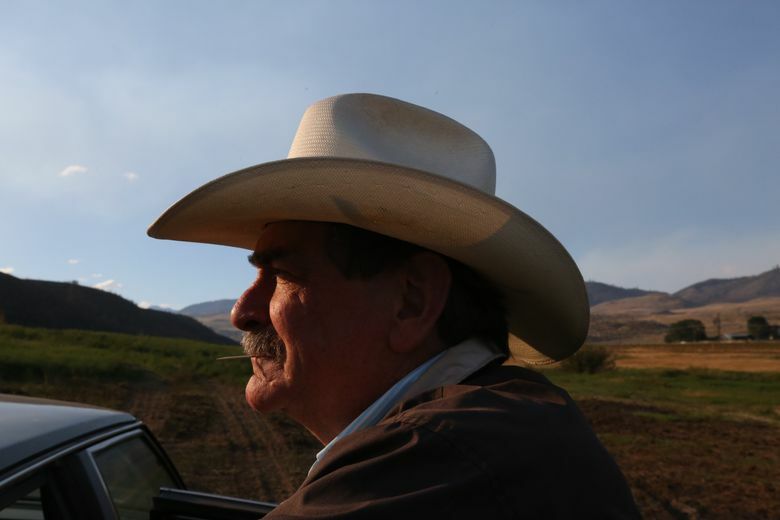 TONASKET, Okanogan County — The cow walks tenderfooted across the field as rancher Gerald Scholz watches, shaking his head. Scholz is medicating her for pain, and he hopes she recovers from burns suffered when she ran through the flames. “That’s brave, she made it out, she’s got grit,” he said. A bull also with burned hoofs hides nearby in tall rushes around a pond, cooling its feet in the mud but not moving. To donate hay or fencing supplies for ranchers hurt by the fire, call Ag Tech feed store in Okanogan at 509-422-1600 between 8 a.m. and 5:30 p.m. Monday through Friday. 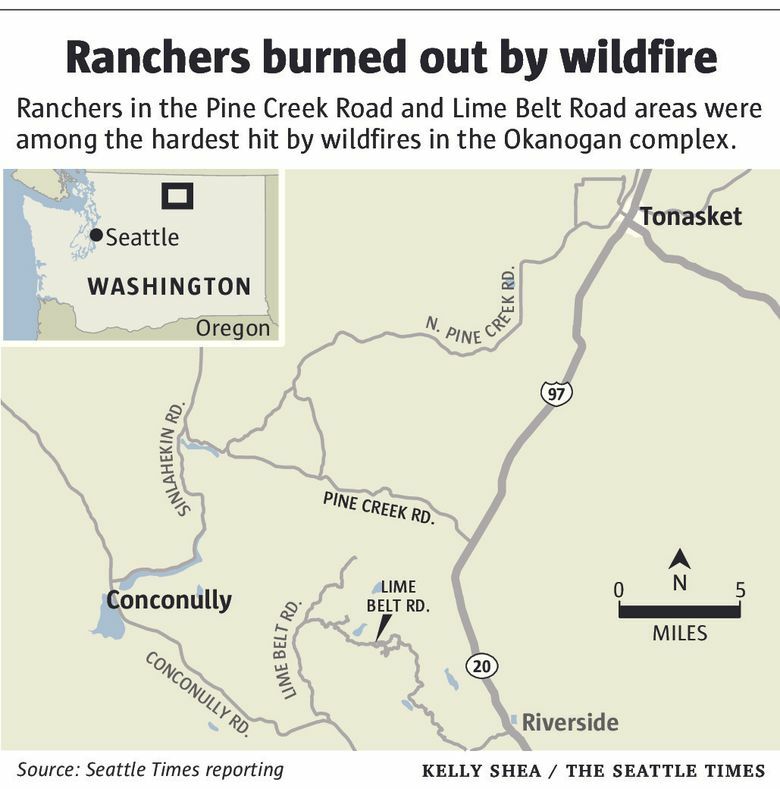 But much of what Scholz built here on his 8,740-acre ranch on Pine Creek Road west of Tonasket has already been lost to wildfires that devastated many ranching families in North Central Washington. 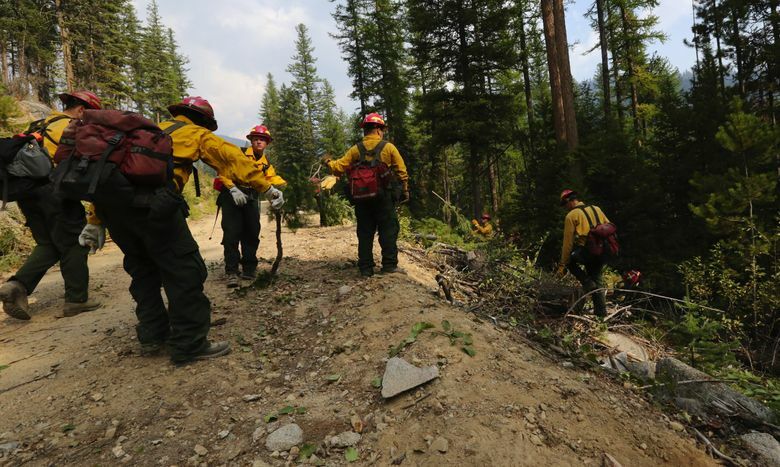 On Aug. 14, a lightning-caused fire started in cattle country here, the beginning of what would come to be known as the Okanogan complex that grew to a maelstrom as winds gusted to 50 miles per hour. 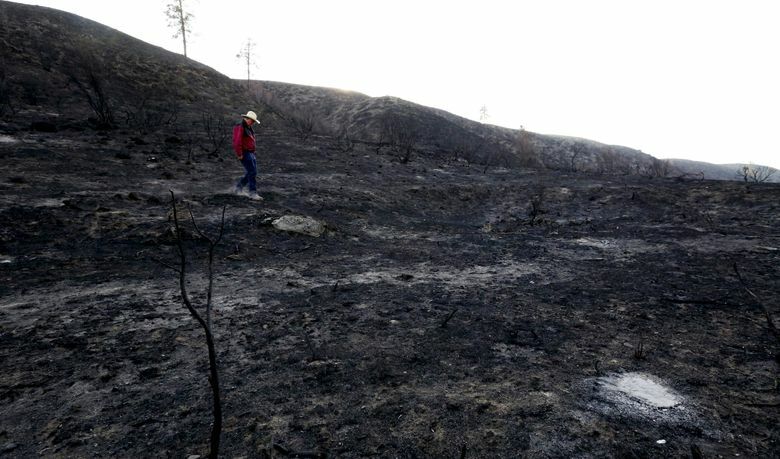 Several other fires also exploded under the hot, dry conditions. 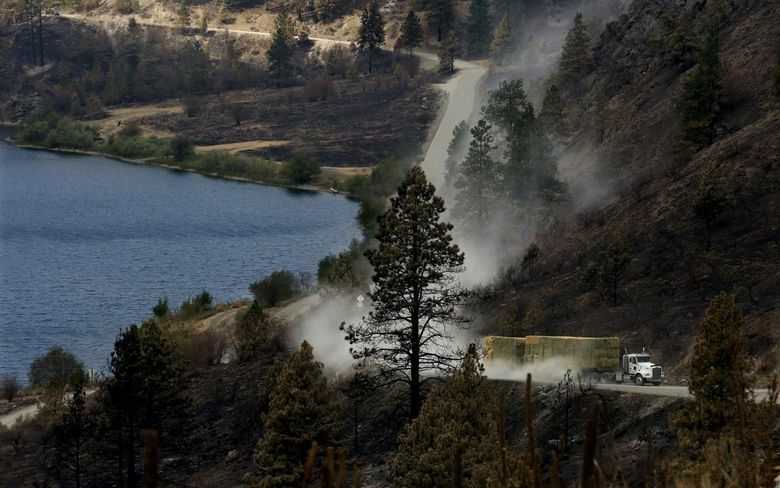 By now, combined with the Carlton fire last year, more than 1,040 square miles — nearly 20 percent of Okanogan County — has burned in back-to-back wildfire seasons, said Craig Nelson, district manager for the Okanogan Conservation District. 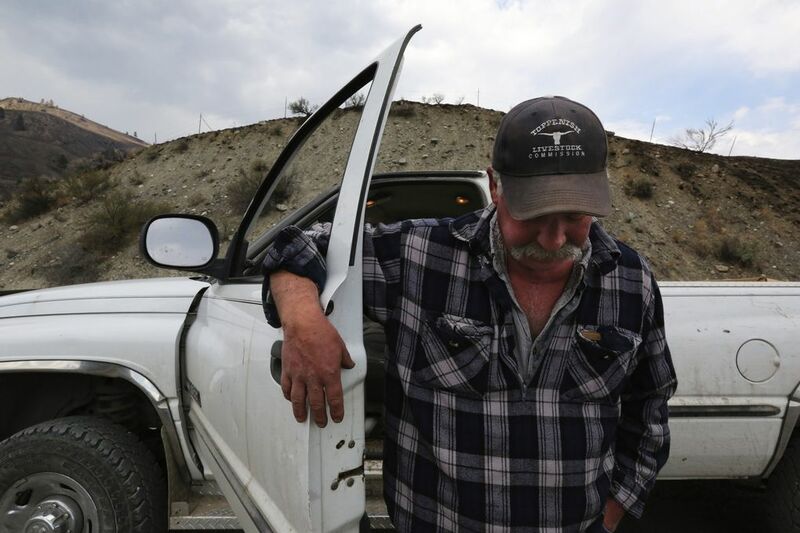 In a place where ranchers have been a cornerstone of the community since before statehood, and produce the second most valuable agricultural commodity in the county after tree fruit, an anchor of the local economy is threatened. 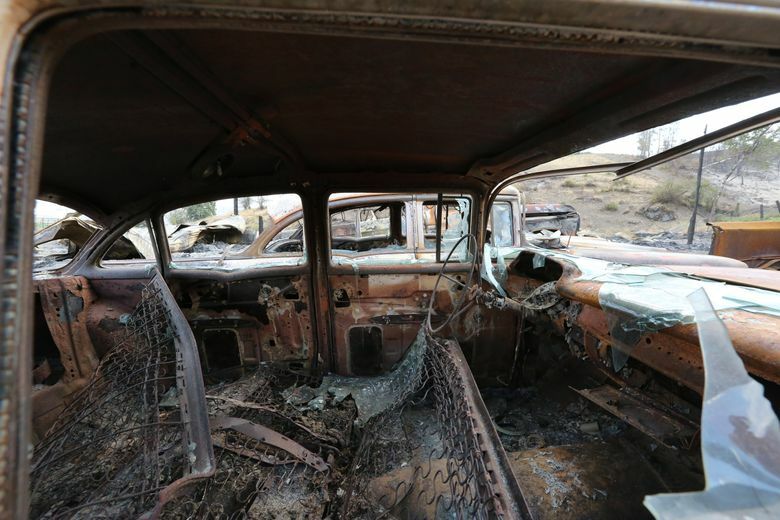 The fires burned through hundreds of square miles of rangeland, destroyed fences and barns, and killed and scattered cattle that ran from the flames. The fires are still burning, and losses are still being counted. 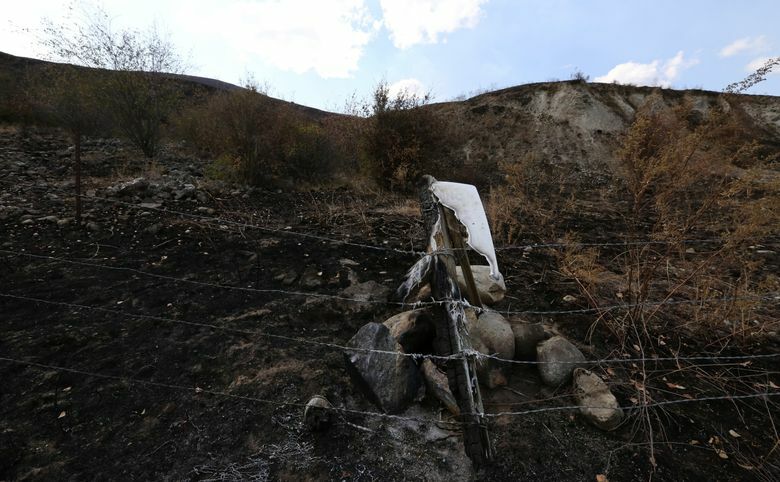 Early estimates are that 1,200 cattle were lost or are still unaccounted for — 10 percent of the livestock in the county — said Jon Wyss, president of the Okanogan County Farm Bureau. He’s chairman of the Carlton Complex Long Term Recovery Group, which is now tasked with helping families and businesses recover from yet another wildfire. About 1,000 miles of fence has burned, and replacing it could cost $8,000 a mile or more, Wyss said. Also destroyed were valuable pasture and hay. Cattle that usually are on pasture at least until October and even into December for some producers have to be fed until next fall, when pasture might recover enough to sustain grazing. A single cow can eat half a ton of hay a month, and with hay at $100 to $200 a ton, depending on quality, ranchers are scrambling. Without enough feed, many ranchers expect to reduce or liquidate their herds — a step of last resort. It takes generations to breed cattle with the disposition and toughness to run on open range in the Okanogan. Culling those animals also costs the calves they would produce in the future. All told, livestock losses could reach $50 million or more over the next seven years, Wyss said. 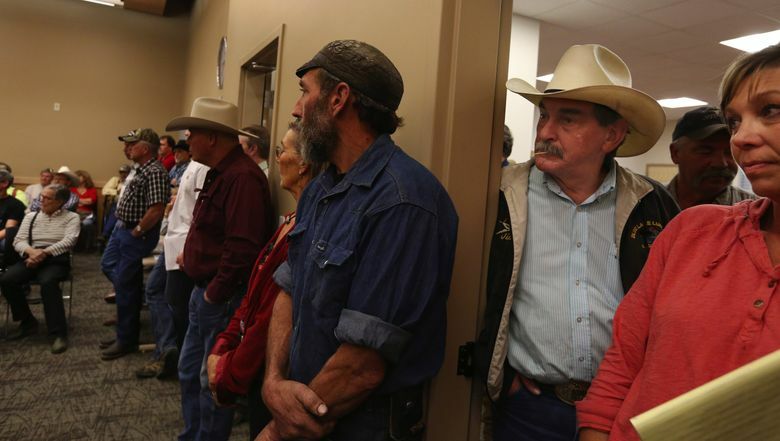 Stu Skidmore, farm-loan manager for the Okanogan office of the federal Farm Service Agency, said his agency can provide some assistance, but it can’t make people whole. “In my 30 years working at this agency, it is the worst disaster that has hit this part of the state,” he said. For now, ranchers are surveying the charred rangeland, looking for trails in the ash to search for animals that are missing. Gray-white and powder fine, ash puffs from rancher Rod Haeberle’s boots as he walks through what used to be his pasture. 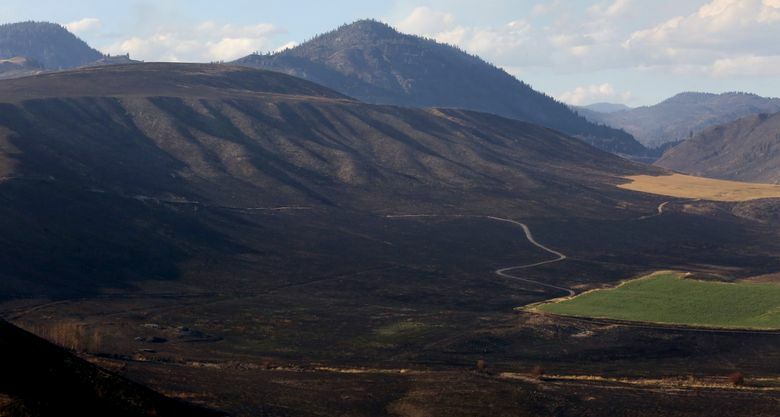 How pasture recovers from the fire and how long it will take depends on the type of soil and plants that were there, and how the fire burned. Some grass will come back better and stronger. But it may be years before some areas can be grazed again, setting off a scramble for forage. For many it will be weeks before they even know what happened to all the animals they care for. “We are animal people,” said Haeberle’s daughter Nicole Kuchenbuch, her eyes tearing as she talks of watching their cattle run through fire last month. She had no idea what happened to some of the “girls” she had to leave behind on the burning range, leaving a gate open for them. With no time to guide the frightened animals to safety, she had to run for her own life. 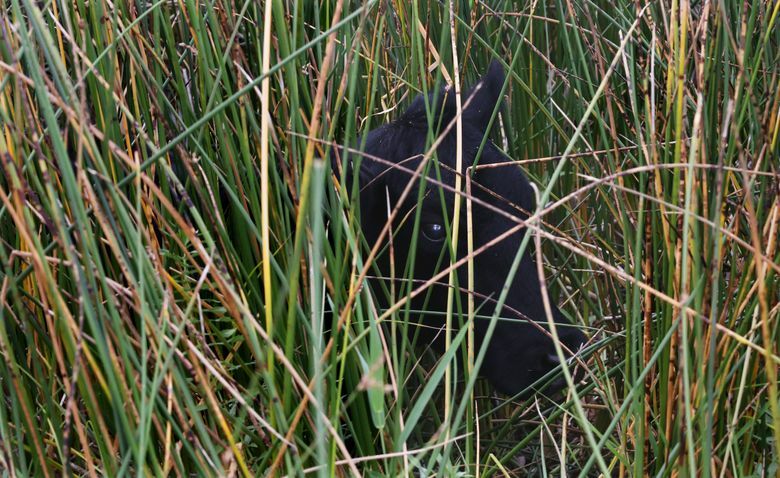 Eighty-four animals were still missing as of Friday. Now the Haeberles, a fifth-generation ranching family outside Conconully, are trying to figure out how to feed their nearly 1,000 animals. 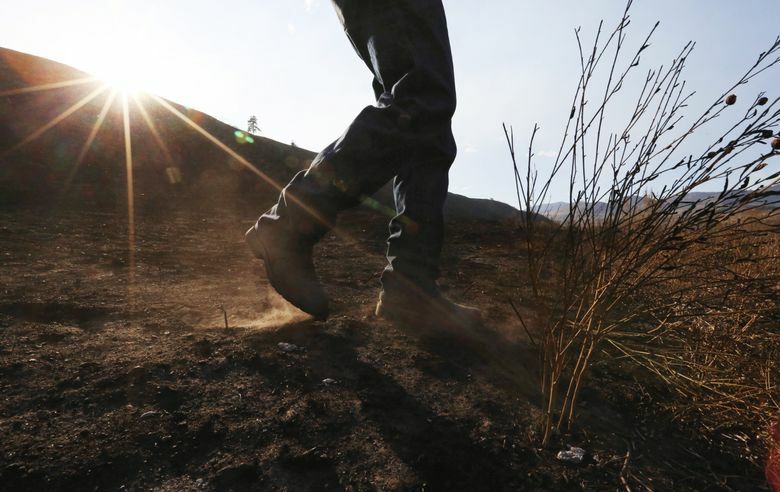 The fire burned most of their 6,300 acres of pasture and some of the best hay they had put up for winter. 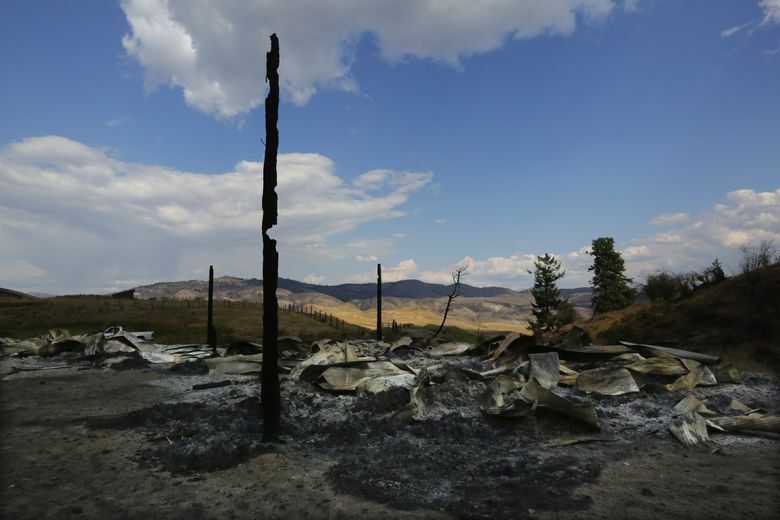 “That’s about $40,000 right there,” Haeberle said, pointing to a heap of charred bales. 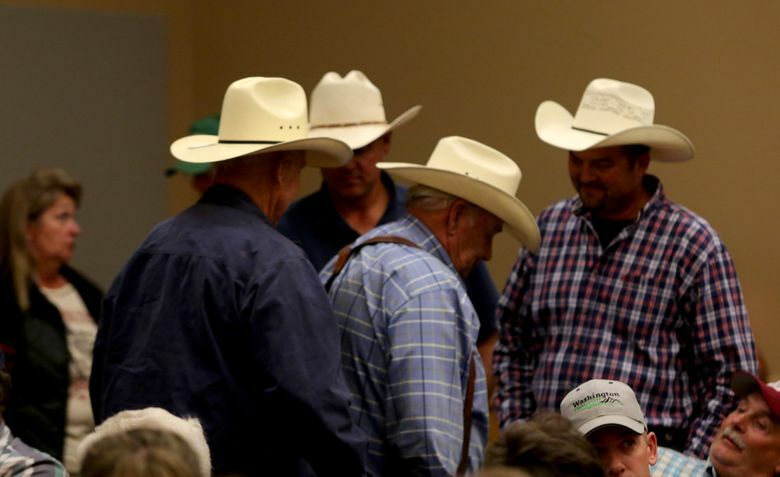 He thinks it will cost him about $150,000 to buy hay to feed cows that should be out on pasture. Come spring, he’s not sure what he’ll do. Monte and Laurie Andrews have started a hay and fencing supply donation hotline at their Okanogan feed store, and are dispatching hay to burned out ranchers all over the county. Donations are coming in from throughout Central and Eastern Washington — even Darrington and Yelm on the west side of the mountains. One 15-year-old boy organized two truckloads of hay donations at the Evergreen State Fair in Monroe. But for all that heart and effort, it’s still not enough. 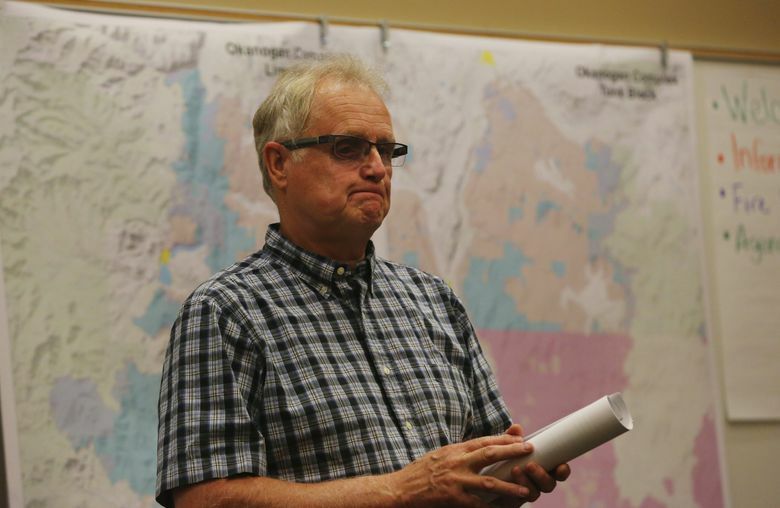 County Commissioner Jim DeTro was born and raised in Okanogan County. After watching so much of his district burn in this summer’s wildfires, he says a different strategy is needed. (Alan Berner & Lauren Frohne / The Seattle Times). 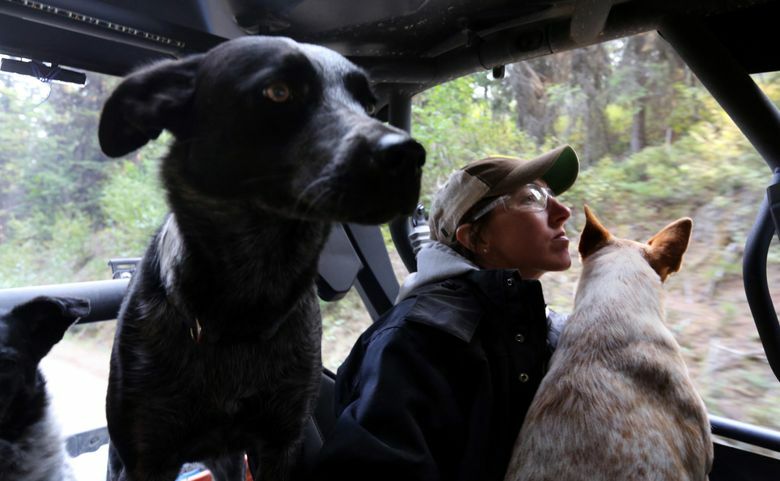 For a three-legged dog, Sally is amazingly spry, jumping into the back of the all-terrain vehicle as rancher Stacey Woodward heads out beyond the fire line in the Salmon Basin to check on her family’s 1,250 cows and calves on Forest Service land between Winthrop and Conconully. She thinks they made it out of the fire, but won’t know for sure until later this fall, when she goes to gather them. Fire engines, log skidders, a bulldozer on a flatbed and more heavy equipment headed past, to work the fire that some figure will keep going until the snow flies. She stopped to talk to another rancher heading out to look for his animals on horseback. Others are searching by plane. Woodward said her family is one of the lucky ones: They have pasture at Royal City, Grant County, they can use this fall. Four packs of Marlboros surround a deep dish ashtray on a picnic table outside Gerald Scholz’s house, about the only thing left on his ranch near Tonasket that was homesteaded by his great-grandfather in 1888. Scholz walks to where the barn he built with his father, packed full with their summer haul of hay, burned to just a few blackened timbers. 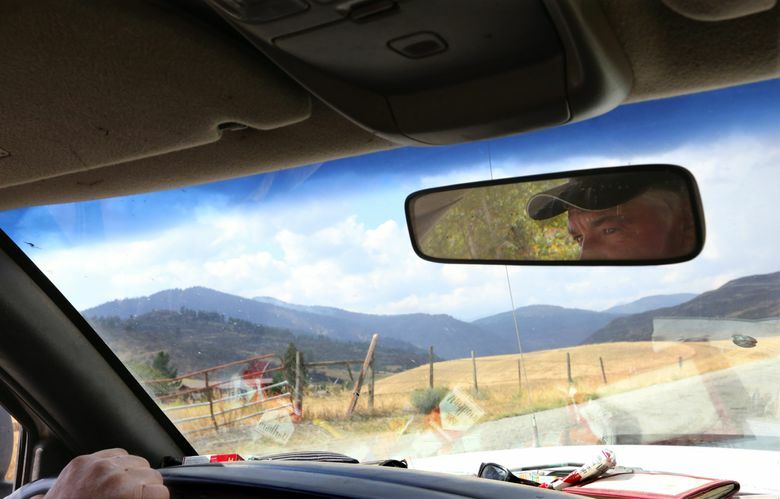 Scholz drives his truck through the timber he and his father had saved in case of hard times, never cutting it. The woodlot was burned to charred trunks and thick gray ash, leaving steep, bare slopes he fears now will slide when the rains come in the fall. 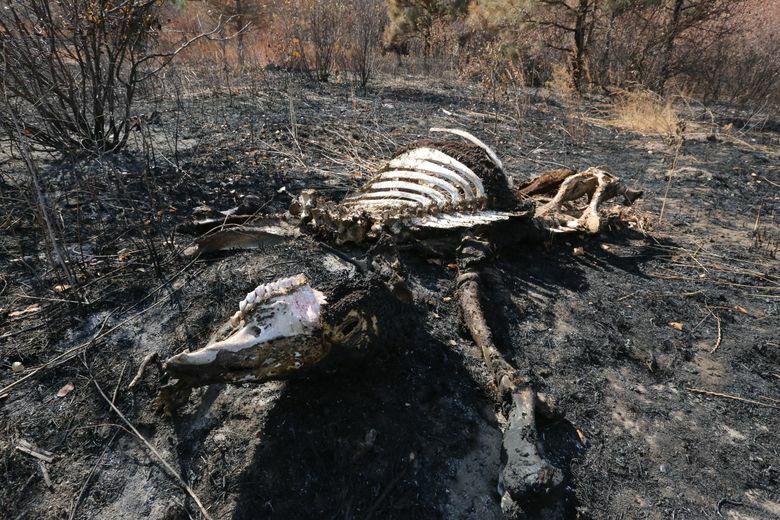 “There’s one that didn’t make it,” he said, seeing the skeleton of a cow near where the barn used to be, burned to nothing but bones and teeth. 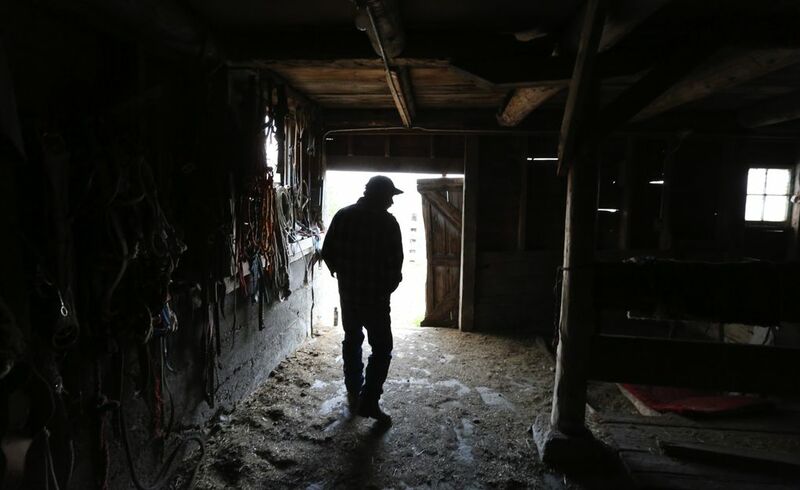 He’s 52 years old, and most of his pasture and timber have been destroyed. Born in Tonasket, he lives in the house he grew up in with his grandparents, that he now shares with his wife. 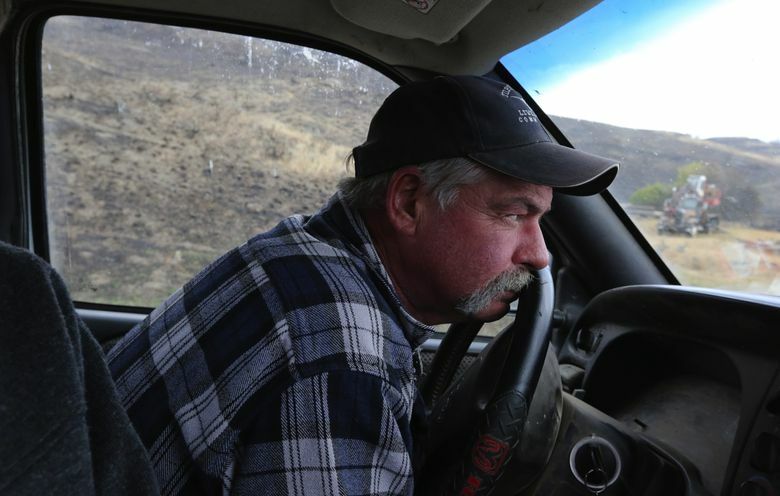 He’s worked as a logger, a rancher, and even a professional rodeo rider. He never worked for anyone else and has no desire to do so now.